Outdoor & Indoor Sports Facilities Construction. Sports Equipment & Implement Supply. 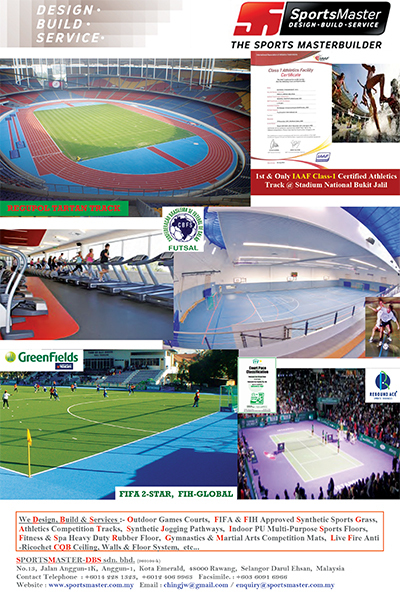 Sports Facilities Design & Consultation Work. Our current project includes the ‘Kompleks Sukan Negara, Bukit Jalil’ Athletic Track Reconstruction, Taman Ilmu sports centre in Besut, Terengganu consisting of an 8 lanes synthetic athletic track, 11 nos of outdoor games courts and an Indoor Multi-Purpose synthetic sports hall consisting of 7 nos Badminton courts.